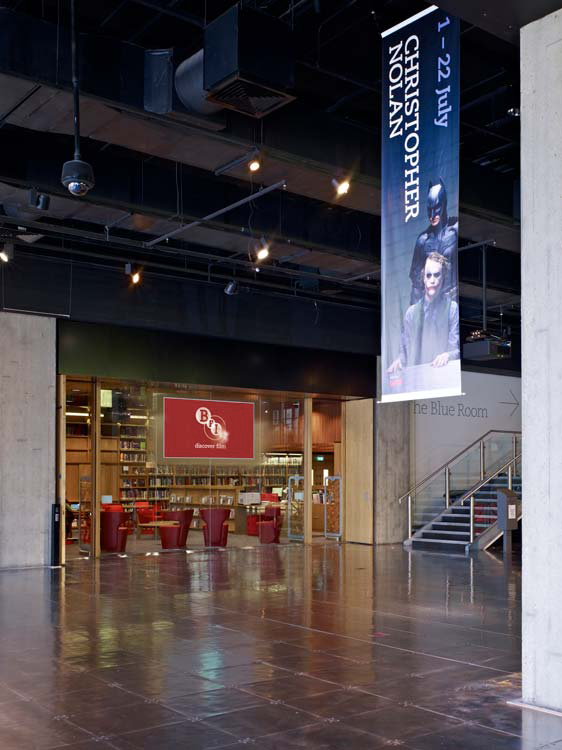 Based on the Southbank in London, the publicly funded BFI wished to expand its BFI National Library service and make it freely accessible to the public. 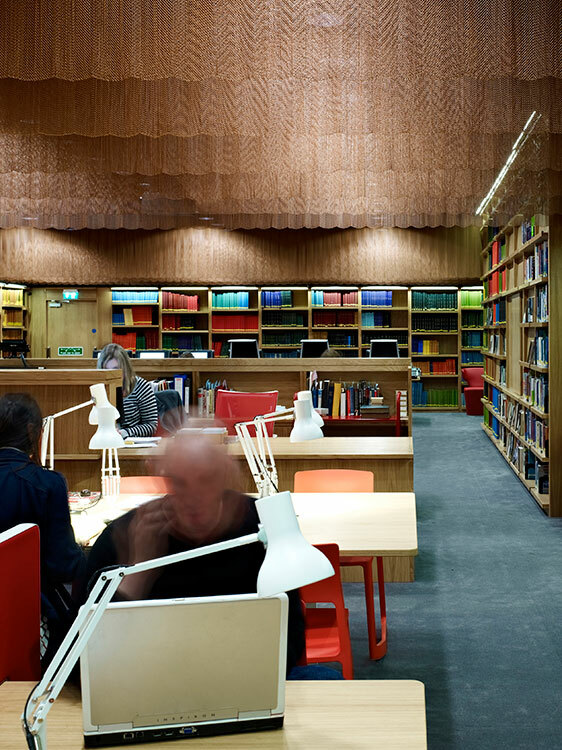 When a 180 m2 former gallery space became free at BFI Southbank, they decided to move the library in. We won the competition, which led to the commission to design the new space in November 2011. They particularly wanted to encourage greater use from new constituencies by including casual seating where people could chat freely without compromising the ability of more serious academic users to study in peace and quiet elsewhere in the space. The predominant technical challenges were to control the acoustics inside the library, block noise from the outside and the atrium, and preserve clear sightlines from the librarians’ work station. With a contemporary twist on the traditional palette of library materials, our design manages the acoustic separation with beautiful bronze mesh curtains. Arranging oak bookcases around the perimeter of the space controls reverberation times and safeguards sightlines for the librarians. Despite the tight schedule, the project was completed on time. The final effect is quiet warmth and filtered light, with stately red tones complementing the calm ambience. 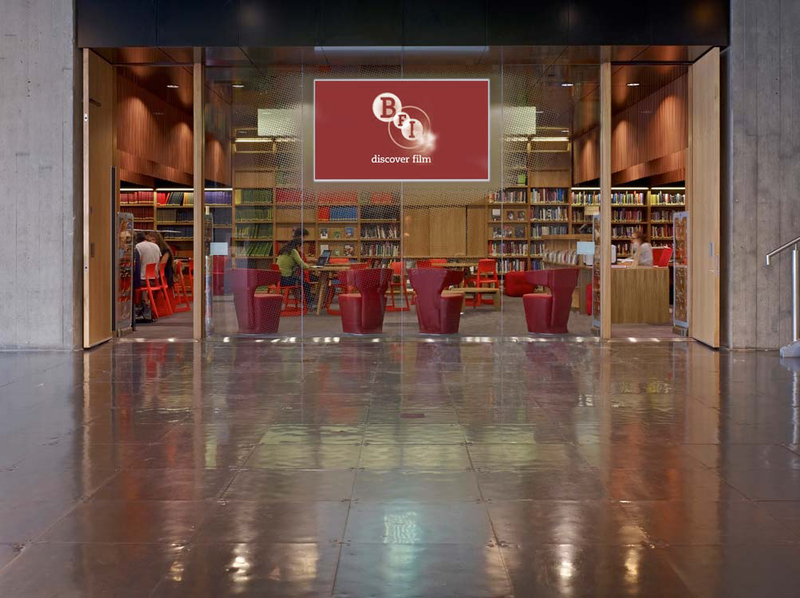 The BFI wished to expand its current library service and make it freely accessible to the public by moving the BFI National Library into a vacated former gallery space at BFI Southbank, underneath the listed Waterloo Bridge. 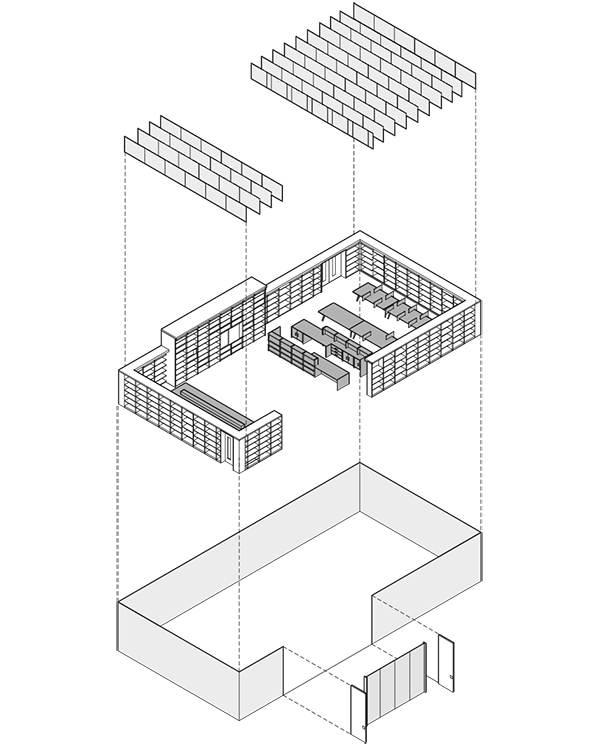 Coffey Architects created a level of separation between the mixed use informal area and the zone for more contemplative study, while allowing clear sightlines for the librarians. To maximise the librarians’ views of the space, all the bookcases were arranged around the perimeter, with the librarians’ desk as at the centre of this panopticon arrangement. Bronze mesh curtain help creating a good acoustic environment which was crucial, particularly considering the library’s diverse uses, and the sometimes noisy foyer outside. Traditional materials associated with libraries – bronze, oak and leather, were used inside the library, but in new ways. The rows of bronze mesh curtains form a datum above the study and research zones, to give a sense of enclosure to these spaces for closer concentration, while allowing clear views through the space below. This rich, translucent material conceals existing services to the ceiling and filters the lighting, while offering a material grandeur appropriate for a library in a public institution. The oak shelving and furniture brings a calmness to the space, contrasting with the steel and glass foyer. Soft furnishings in shades of red enliven the mixed use informal area. The screen between the lobby and the library is perceived as the "Fourth Wall" - the theatrical term for the imaginary “wall” between actors on stage and the audience. The screen opens up the library to the lobby as well as providing news about what is going on in the library as well as in the rest of BFI.